Not everyone wants spooky costumes for Halloween. If that's your kids, then you need to hot foot it over to Matalan. They have a SUPER offer on selected Disney and Marvel Dress Up Costume. Choose from a selection of Disney/Marvel Dress Up Outfits at £10 each. Considering they would normally cost £14-£18, I'd say this is brilliant. It's not even as if Matalan have put all of the poor selling outfits on offer either. 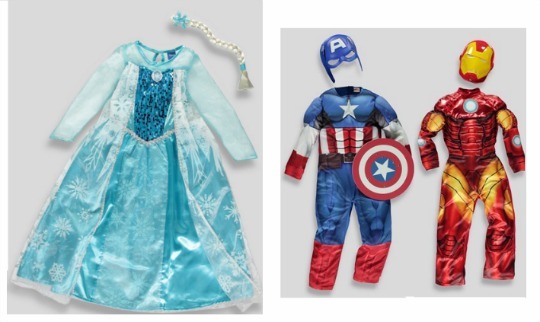 Here are some of them that are reduced to just £10 each: Disney Frozen Elsa Costume*, Iron Man*, Disney Cinderella*, Captain America*, Spider-Man*, Disney Tinkerbell*, Disney Frozen Fever Anna*, Disney Frozen Fever Elsa*, Disney Frozen Elsa Coronation Dress* and Hulk*. These would make amazing Christmas presents for children of friends, nieces or nephews, or even your own kids. There's also selected Disney and Marvel T-Shirts, reduced to just £4. You can check those out, here*. You can Click and Collect your Disney/Marvel Dress Up Outfits for FREE from a Matalan store near you or pay £3.95 to have it delivered. Spend £50 and you can benefit from FREE delivery.